A radical shift is happening in the marketplace--consumers are increasingly basing purchasing decisions not solely on value, but on their values. As I detail in my new book, The New Rules of Green Marketing: Strategies, Tools and Inspiration for Sustainable Branding (Berrett-Koehler; February 2011), now more than ever, consumers of all stripes are demanding that the brands they buy and the companies that make them, share their own personal social and environmental values. Consumers are increasingly seeing businesses as linchpins with the resources and the incentives to address pressing societal needs (and this is especially so when government is seen as falling behind or inadequate in this regard.) This perception is changing the rules of the road for marketers who must respond quickly or risk being left behind by offerings viewed as more authentic and committed to sustainability. As I detail in the book, new rules are being written by consumers for manufacturers and marketers. 1. Values guide consumer purchasing. Historically, consumers bought solely on price, performance, and convenience. But today, how products are sourced, manufactured, packaged, disposed of - and even such social aspects as how factory and farm workers are treated - all matter. This green consciousness is not confined to the younger generations. Over half of Baby Boomers consider themselves socially conscious shoppers. That's 40 million green boomers who choose to organize, pluck resource-conserving products from the shelves, boycott products of companies that pollute, and "pro-cott" the products of companies that give back to the community. 2. Life Cycle Considerations are Important. Today's consumers are doing more than just checking prices and seeking out familiar brand names. They turn over packages in search of descriptors that reflect a panoply of environmental and social issues that can impact a product throughout its entire life cycle. In the same breath, consumers can look for products that are at once, "pesticide free" "fair trade" and "sustainably harvested." Representing a sea change in the history of promotion, marketers need to move beyond sheer product benefits in their messages and tell the whole story behind their offerings. 3. Manufacturer and retailer reputation count now more than ever. Not all greener products have ecolabels or green claims emblazoned on them. Many consumers defer to manufacturer and retailer reputations as a defacto eco-label. Consumers are asking, "Who makes this brand? Did they produce this product with high environmental and social standards?" That's one reason why S.C. Johnson is quick to remind us that they are "A Family Company", and why CEOs such as Tom Chappell (Tom's of Maine), Gary Hirshberg (Stonyfield Farm) and Yvon Chouinard (Patagonia) maintain high profiles. 4. Businesses are their philosophies. It used to be that companies were what they made. International Business Machines. General Foods. General Motors. Now, businesses and brands are what they stand for. San Francisco-based Method's innovative line of household cleaning products uses design, fragrance, efficacy, and environmental and personal safety to make cleaning a positive experience for the individual and the environment. Their "People Against Dirty" campaign" featured on the methodhome.com website and their equally empowering "Say no to (laundry) jugs" campaign supporting their new 8X concentrated laundry detergent in waste-free squirt bottle equip consumers with the wherewithal to make a difference. Meanwhile, "Starbucks proves that a global company serving 50 million people per day can turn a proactive approach to sustainable sourcing and operations into a strategic and profitable part of its brand. And Timberland's attention to quality, passion for the environment and society, and commitment to transparency has helped earn a strong customer following willing to pay its premium. 5. Nearly everyone is a corporate stakeholder. A reflection of the growing social consciousness that exists among today's consumers, corporate stakeholders are no longer confined to just customers, employees, and investors; today, publics of all stripes are now corporate stakeholders including environmentalists, educators, and children - even the unborn. For instance, the astronomic rise in cause-related marketing efforts, now refined to a science helps business such as Starbucks and in turn, their enlightened customers support people living with AIDS in Africa. 6. Authenticity. It's not enough to slap on a recycling logo or make a biodegradability claim. Brands viewed as the most genuine integrate relevant sustainability benefits into their products. That's why HSBC and Stonyfield Farm aim to reduce the carbon impacts of their corporate operations. Their industry-leading track record for managing their carbon footprint (which we at J. Ottman Consulting advised them on) undergirded HSBC's Effie award- winning "No Small Change" green marketing campaign which empowered consumers to reduce their own carbon footprint, in line with the bank's own experience. © 2011, J. Ottman Consulting, Inc. All rights reserved. Do not republish without permission. 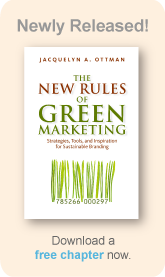 by Jacquie Ottman, Founder and Principal, J. Ottman Consulting, Inc. An expert adviser on green marketing to Fortune 500 companies and the U.S. government, she is the author of the newly released, The New Rules of Green Marketing: Strategies, Tools, and Inspiration for Sustainable Branding Follow Jacquie on Twitter: @jacquelynottman. Connect with Jacquie on Linkedin. Read Jacquie's Green Marketing Blog.